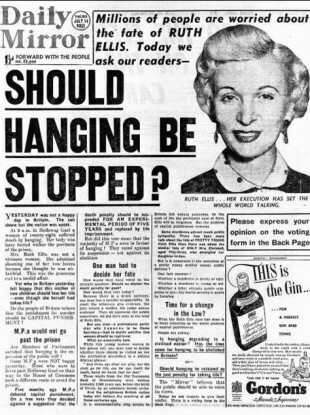 ON EASTER SUNDAY 1955, 28-year-old Ruth Ellis fired four bullets at point-blank range into David Blakely outside the Magdala pub in Hampstead, London. Having killed her abusive lover, Ellis was arrested and taken to Holloway Prison to await trial for murder. Alone in jail, she found peace, says Irish artist Christina Reihill, whose upcoming London exhibition Glad I Did It recreates Ellis’ prison cell and invites its audience into the mind of the last woman to be hanged in the UK. Working as a journalist in London in the 1980s, Reihill was one day contacted by a friend who’d been in touch with an Irish man who’d worked with Ruth Ellis at the Little Club in Knightsbridge, which Ellis managed. Though captivated, it would be another 30 years before the journalist-turned-artist returned to Ruth Ellis, to a trial that divided a nation. As Reihill puts it, her own life “was filed away into disaster”. Reihill set about researching Ellis’ life and the events leading up to her killing Blakely. Here was a tragic story, says Reihill. In order to get two pennies together she was either on her back or serving drinks. It was a non-stop frenetic life from the age of 14 when she left school. Born in 1926, Ellis worked as a hostess, prostitute and model. While managing the Little Club, she met David Blakely with whom she began a tempestuous relationship, Blakely causing Ellis to miscarriage after he punched her in the stomach. The pair continued to see each other despite Ellis’ relationship with Desmond Cussen, from whose flat she left on the 10 April 1955 in pursuit of Blakely. At 9:30pm, as he emerged from the Magdala with his friend Clive Gunnell, Ellis called to Blakely whom she shot at point-blank range, killing him. Stunned, she was arrested immediately. Ellis’ subsequent case captivated the UK and renewed the death penalty debate. Her trial lasted one day, her fate sealed when asked by the Prosecution what she intended to do when she fired the revolver at close range. “It is obvious when I shot him I intended to kill him,” she replied. Since 1955, there have been numerous campaigns seeking a posthumous pardon for Ellis. Ellis’ time in her condemned cell – and questions surrounding desire, grief and true love – are what artist Reihill chose to focus on. “It’s obvious that the condemned cell is her mind,” she says. Having gathered “every single piece of information” from Ellis’ time at Holloway Prison, Reihill says she set about recreating her time spent in her prison cell. Recorded by prison wardens, Ellis’ day-to-day life while awaiting trial were not what one might expect from a condemned prisoner, says Reihill. She is reading. She’s is sleeping. She’s chatting. She’s receiving guests. People appear to meet her as if she were having them for tea. Featuring prison files, psychiatrist notes and diary entries, Glad I Did It allows visitors to step inside Ellis’ mind in the lead up to her death and examine what led her to murder Blakely. With the use of audio recordings, Reihill’s installation – which runs at Bermondsey Project Space in London from 14 November to 1 December – seeks to explore the psychology surrounding Ellis’ action, which led to her hanging on 13 July 1955. On the ground floor, says artist Ellis, visitors to Project Space will enter Ellis’ “condemned cell”. Over three gallery floors of 1950s set pieces – including the hanging rope and trapdoor – Glad I Did It allows the audience to make up their own minds about Ellis’ actions, says Reihill. I’m not taking a moral position. I’m entirely focused on her mind. The audience will be divided, though. Some might find it profoundly offensive. For others, it makes sense. Email “Prison cell of the last woman hanged in the UK recreated in London”. Feedback on “Prison cell of the last woman hanged in the UK recreated in London”.